Yes, we are talking about TeX and friends! Edit: I decided to move the background motivation to the end of the question, since it seems to be kind of off-topic in the TeX context. The following code is just a preliminary idea. My plan is to hide a notebook inside the Sistine Chapel, open a spreadsheet application and start to count votes for the new pope election. 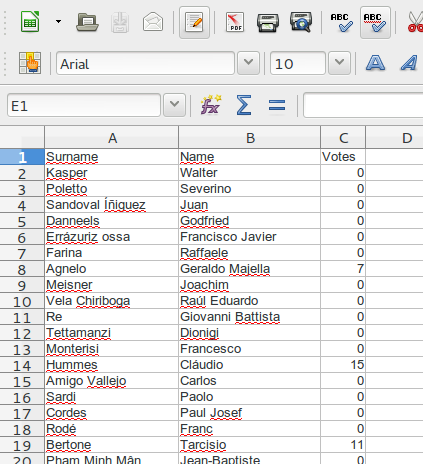 The following list contains the name of the 115 candidates to become the new pope. In the whole process, data is manually tabulated according to the voting ballots, and every cardinal annotates in his own vota scrutinii the number of votes for each candidate. It's still ruled by ink and paper. Now, it's just a matter of exporting data to .csv and use Nicola Talbot's awesome datatool package in order to generate a beautiful report for the cardinals! But wait a minute, we still need to keep up the tradition, ink and pen. Thanks to my buddy percusse, it's TikZ time! Let's fake some handwriting annotation for the votes! The idea here is very simple: get the number of votes, generate a TikZ picture with a visual representation of the current number and present it. Being catholic, the election of a new pope is a milestone for me. Actually, with Pope Benedict XVI resigning, this will be the second election I watch - Pope John Paul II was elected in 1978, a few years before I was born, but of course I watched Cardinal Ratzinger being elected. :) I even saw the white smoke on television! My dad used to tell me a lot of stories from past elections. 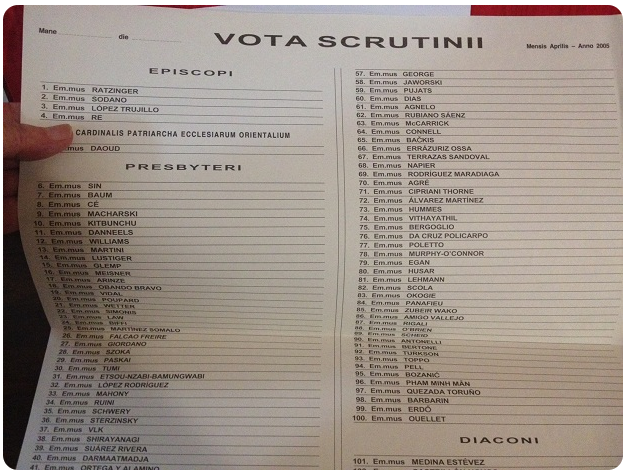 I think the whole process is quite amusing, specially the way cardinals vote for their candidates. Cardinal José Freire Falcão, former archbishop of Brasília, gave a very nice interview to a Brazilian website in which he showed documents from the last conclave. 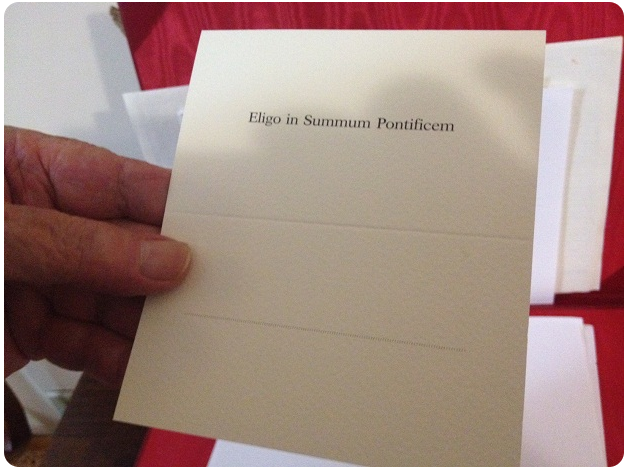 This is the voting ballot, where the cardinal writes down the name of his choice. After every cardinal casts his vote, it's time to tabulate data! 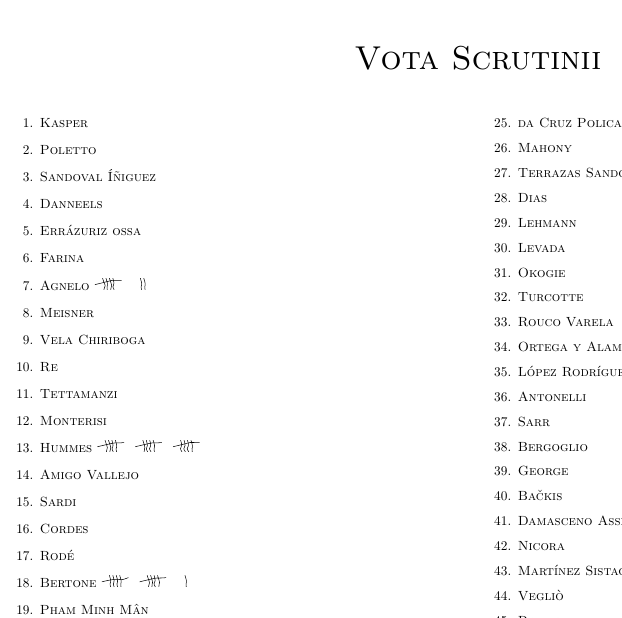 This is done in this other document, called vota scrutinii. My datatool skills are limited, so the following solution uses TeX primitives and PGFs mathematical engine and also its \pgfutil@in@ macro/conditional. Line 99: Minimum ratio a Cardinal needs to get elected as Pope. 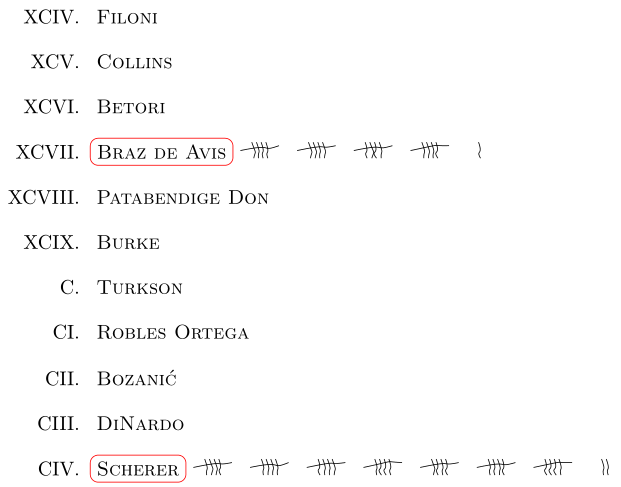 Line 70: Number of Cardinals that will be marked if no one has reached the limit. As this will be used inside a \foreachloop it should be at least 3 (→ Top 3). There are some explanations needed: If two or more Cardinals got the same number of votes they will both be added to the Top list. This means that, although the numberOfTopCardinals is set to, say 5, we could have six or more Cardinals in the Top 5 list. Aka “Tie”. The \ifHabemusPapam conditional can be used to check whether the limit of minimum votes has been reached by one of the Cardinals. The styles papa, not papa and top as well as every name can be used to change the appearance of the list. The \votesOfTopCardinals macro will contain all number of votes that appear in the top list. Check if the top number of votes (\votesForPlace1) is greater or equal than the amount needed. This will set \ifHabemusPapam. If someone has more than two thirds of the votes, he will be assigned style papa. If no one has more than two thirds of the votes, it will be checked if the amount of votes exist in the top list. If yes, he will be assigned top, otherwise not papa. The resulting TikZ node uses the selected style and the every name style. Not the answer you're looking for? Browse other questions tagged tikz-pgf datatool fun or ask your own question. Use datatool to read a row from a CSV file, then use the variables in the document? How to extract the currency symbol? How to count the number of occurences using datatools?